I was very excited to see the article “Coconut Oil” by Aglaée Jacob, MS, RD, in your October issue, which supports the more recent information about coconut oil and, more importantly, saturated fat. I have been a dietitian in a residential eating disorder facility for 6 1/2 years. Daily I have to dispute outdated misinformation about the evils of saturated fat. I believe the science of nutrition is always evolving. The question is, as the nutrition field evolves, will the dietetics professional be willing to hear the latest scientific research that will help create new evidence-based guidelines and practices? I’m glad to see that you’re willing to push the envelope and keep up with the current research. I’m excited for more articles like this. Keep up the great work. Thank you! I was very disappointed in the quality of the recent article “Coconut Oil.” Not only was the article poorly supported by science, it ended with a personal recommendation of one RD, not a recommendation based on the body of scientific evidence. Many of the references were dated (eg, 2000, 2007), and one reference in the article wasn’t mentioned in the list of references. In one reference, the author refers to changes in inflammatory markers with the use of medium-chain triglyceride oils but lists as a reference a study conducted in children with epilepsy. Connecting that reference to a benefit from coconut oil is an inappropriate stretch. As your article stated, “Other studies have reported a decrease in inflammatory cytokines, such as tumor necrosis factor alpha and interleukin-6, and increased production of the anti-inflammatory IL-1 with consumption of coconut oil and MCT oil” (based on Kossoff EH, Zupec-Kania BA, Amark PE, et al. Optimal clinical management of children receiving the ketogenic diet: recommendations of the International Ketogenic Diet Study Group. Epilepsia. 2009;50(2):304-317). I could continue with my deep concerns about the quality of this article and the failure of the author to provide good scientific evidence, but hopefully these examples will get you thinking about what the message this article sends. And finally, how do you define “superfood”? Thank you so much for publishing the article “Coconut Oil.” I’m so happy to see articles like this one that are finally discussing the misconception about saturated fats and cardiovascular disease. I’ve read too many articles in which RDs dismiss the potential benefit of adding coconut oil to the diet. I’m tired of attending conferences where RDs only limit themselves to the “low-fat” or “fat-free” mentality. The research on cholesterol and fat is changing. Thank you for publishing articles that will inform RDs to look deeper into the issues and change their perspective. I want to write a word of thanks for the article “Coconut Oil” by Aglaée Jacob, MS, RD, CDE, published in the October issue, which discussed the health benefits of coconut oil. As a dietitian who prides herself on keeping up with the most current evidence-based guidelines as the basis for giving nutrition advice, it was so refreshing to see such a modern and scientifically based analysis of an oft-maligned and misunderstood food. I particularly appreciated the magazine’s willingness to “color outside the lines” of conventional nutrition advice concerning saturated fats, which for many years have been based on governmental guidelines and the momentum and popularity of the idea rather than real, evidence-based science. The body of research that names saturated fat as the major culprit of heart disease is weak at best and has been thoroughly disproven by a number of well-designed studies and large meta-analyses. The history of the lipid hypothesis and the government’s involvement in developing unproven nutrition guidelines as well as the real science behind saturated fats and heart disease would be a wonderful topic of interest for future publication. Thank you so much for your sharing of this excellent evidence-based information, and I hope to read more articles in the future that embrace the most modern research findings in the realm of nutrition. The public should be able to count on registered dietitians for accurate nutrition information. To suggest that saturated fats don’t matter in the risk of cardiovascular diseases is just wrong. I want to thank you for publishing “Coconut Oil.” It was such a great article on the benefits of coconut oil. It’s refreshing to see articles published that go against our conventional teachings. How can saturated fat be healthful? Simple nutritional biochemistry can prove that fats such as coconut oil can provide many benefits and be part of a healthful diet. I think it’s important for all dietitians to be conscious and open-minded about all fats, even “good” saturated fats. Thanks again for publishing, and please keep the nonconventional articles coming! As a whole-foods dietitian, I want to thank you so much for publishing the article “Coconut Oil.” The medium-chain triglycerides in coconut oil are indeed beneficial and so are many other saturated fats that have been unfairly characterized as unhealthful. Several studies and a large meta-analysis by Siri-Tarino and colleagues, published in the March 2010 issue of The American Journal of Clinical Nutrition, have demonstrated that there’s a lack of evidence linking saturated fat to an increased risk of heart disease. I’m writing to thank you for publishing the recent article “Coconut Oil.” This was a well-researched and well-written article. It shows progress in the dietetics field toward the whole-food approaches that really work in the face of the current chronic disease epidemic. I believe that saturated fats from good sources are a necessary component for health, and the research backs this up. Coconut oil is a wonderful traditional food and beneficial for many people. Thanks again for publishing such a wonderful article! I want to express my gratitude for your inclusion of such a forward-thinking article in the October issue. As a nutrition student and soon-to-be RD who’s deeply interested in learning the most accurate science supporting my nutrition recommendations, it’s so refreshing to see an article that’s solidly rooted in our best available evidence. While for many years we were taught that eating saturated fat leads to heart disease, the most current data available simply do not support that belief. This is just one of the many peer-reviewed articles showing that our understanding of how saturated fat affects our health is inadequate and possibly inaccurate, as saturated fat from whole-food sources actually may be health promoting. I’m pleased to see that Today’s Dietitian is so open to presenting alternative viewpoints on nutrition that are well supported with current evidence. The article “Coconut Oil,” along with the September 2012 Web exclusive, “Milk Fat Does a Body Good” by Karen Giles-Smith, MS, RD, have been my favorites from Today’s Dietitian. I will continue to read your publication and remain excited to see what other informative articles will be published in the future. Keep up the good work! 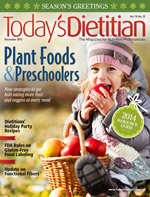 Today’s Dietitian received much feedback concerning my article “Coconut Oil,” which ran in the October issue. While many readers agreed with the research supporting the health benefits of the saturated fats in coconut oil, others did not. Coconut oil and saturated fats have been vilified for almost four decades despite being part of the human diet for thousands of years before the large-scale introduction of refined vegetable oils. Not all fats are created equal, as nutrition professionals know. There’s no doubt that trans fats are considered “bad fats,” but the current scientific evidence does not justify lumping saturated fats with trans fats in the artery-clogging category. It’s important for nutrition professionals to have a critical eye when interpreting epidemiologic studies and remember that correlation doesn’t equal causation. Moreover, the year an article is published doesn’t necessarily have anything to do with its quality and credibility. I highly recommend all nutrition professionals who are interested in evaluating fats and carbohydrates from another perspective read Good Calories, Bad Calories by Gary A. Taubes, MSE, MS, to learn about his meticulous account of the historical, political, and scientific influences that have forged the science of nutrition we know of today. With regard to the definition of the term “superfood,” coconut oil fits the bill. The term isn’t regulated by any US or Canadian organization, but it’s used to describe foods providing health benefits beyond their nutrient value or foods that benefit specific medical conditions. Coconut oil contains unique MCTs that qualify this natural fat as a superfood, considering its exceptional ability to promote a ketogenic state, which appears to provide therapeutic benefits for several neurodegenerative conditions, including epilepsy, Parkinson’s disease, and Alzheimer’s disease.26,27 The MCTs in coconut oil also are easier to absorb for patients suffering from digestive issues or who have undergone a cholecystectomy, and MCTs offer interesting antimicrobial properties. 1. Hite AH, Feinman RD, Guzman GE, Satin M, Schoenfeld PA, Wood RJ. In the face of contradictory evidence: report of the Dietary Guidelines for Americans Committee. Nutrition. 2010; 26(10):915-924. 2. Siri-Tarino PW, Sun Q, Hu FB, Krauss RM. Meta-analysis of prospective cohort studies evaluating the association of saturated fat with cardiovascular disease. Am J Clin Nutr. 2010;91(3):535-546. 3. Rong Y, Chen L, Zhu T, et al. Egg consumption and risk of coronary heart disease and stroke: dose-response meta-analysis of prospective cohort studies. BMJ. 2013;346:e8539. 4. Yamagishi K, Iso H, Yatsuya H, et al. Dietary intake of saturated fatty acids and mortality from cardiovascular disease in Japanese: the Japan Collaborative Cohort Study for Evaluation of Cancer Risk (JACC) Study. Am J Clin Nutr. 2010:92(4):759-765. 5. Lawrence GD. Dietary fats and health: dietary recommendations in the context of scientific evidence. Adv Nutr. 2013;4(3):294-302. 6. Hoenselaar R. Saturated fat and cardiovascular disease: the discrepancy between the scientific literature and dietary advice. Nutrition. 2012;28(2):118-123. 7. Micha R, Mozaffarian D. Saturated fat and cardiometabolic risk factors, coronary heart disease, stroke, and diabetes: a fresh look at the evidence. Lipids. 2010;45(10):893-905. 8. Malhotra A. Saturated fat is not the major issue. BMJ. 2013;347:f6340. 9. Astrup A, Dyerberg J, Elwood P, et al. The role of reducing intakes of saturated fat in the prevention of cardiovascular disease: where does the evidence stand in 2010? Am J Clin Nutr. 2011;93(4):684-688. 10. Campos H, Genest JJ Jr, Blijlevens E, et al. Low density lipoprotein particle size and coronary artery disease. Arterioscler Thromb. 1992;12(2):187-195. 11. St-Pierre AC, Cantin B, Dagenais GR, et al. Low-density lipoprotein subfractions and the long-term risk of ischemic heart disease in men: 13-year follow-up data from the Québec Cardiovascular Study. Atherioscler Thromb Vasc Biol. 2005;25(3):553-559. 12. Packard C, Caslake M, Shepherd J. The role of small, dense low density lipoprotein (LDL): a new look. Int J Cardiol. 2000;74 Suppl 1:S17-22. 13. Gardner CD, Fortmann SP, Krauss RM. Association of small low-density lipoprotein particles with the incidence of coronary artery disease in men and women. JAMA. 1996;276(11):875-881. 14. Bittner V, Johnson BD, Zineh I, et al. The triglyceride/high-density lipoprotein cholesterol ratio predicts all-cause mortality in women with suspected myocardial ischemia: a report from the Women’s Ischemia Syndrome Evaluation (WISE). Am Heart J. 2009;157(3):548-555. 15. Hadaegh F, Khalili D, Ghasemi A, Tohidi M, Sheikholeslami F, Azizi F. Triglyceride/HDL-cholesterol ratio is an independent predictor for coronary heart disease in a population of Iranian men. Nutr Metab Cardiovasc Dis. 2009;19(6):401-408. 16. Emerging Risk Factors Collaboration, Kaptoge S, Di Angelantonio E, et al. C-reactive protein concentration and risk of coronary heart disease, stroke, and mortality: an individual participant meta-analysis. Lancet. 2010;375(9709):132-140. 17. Polonsky TS, McClelland RL, Jorgensen NW, et al. Coronary artery calcium score and risk classification for coronary heart disease prediction. JAMA. 2010;303(16):1610-1616. 18. Dreon DM, Fernstrom HA, Campos H, Blanche P, Williams PT, Krauss RM. Change in dietary saturated fat intake is correlated with change in mass of large low-density-lipoprotein particles in men. Am J Clin Nutr. 1998;67(5):828-836. 19. Parks EJ, Krauss RM, Christiansen MP, Neese RA, Hellerstein MK. Effects of a low-fat, high-carbohydrate diet on VLDL-triglyceride assembly, production, and clearance. J Clin Invest. 1999;104(8):1087-1096. 20. Volek JS, Forsythe CE. The case for not restricting saturated fat on a low carbohydrate diet. Nutr Metab (Lond). 2005;2:21. 21. Ginsberg H, Olefsky JM, Kimmerling G, Crapo P, Reaven GM. Induction of hypertriglyceridemia by a low-fat diet. J Clin Endocrinol Metab. 1976;42(4):729-735. 22. Kuipers RS, de Graaf DJ, Luxwolda MF, Muskiet MH, Dijck-Brouwer DA, Muskiet FA. Saturated fat, carbohydrates and cardiovascular disease. Neth J Med. 2011;69(9):372-378. 23. Ramsden CE, Zamora D, Leelarthaepin B, et al. Use of dietary linoleic acid for secondary prevention of coronary heart disease and death: evaluation of recovered data from the Sydney Diet Heart Study and updated meta-analysis. BMJ. 2013;346:e8707. 24. Kossoff EH, Zupec-Kania BA, Amark PE, et al. Optimal clinical management of children receiving the ketogenic diet: recommendations of the International Ketogenic Diet Study Group. Epilepsia. 2009;50(2):304-317. 25. Jacob A. Coconut oil: learn more about this superfood that contains healthful saturated fats. Today’s Dietitian. 2013;15(10):56-60. 26. Tieu K, Perier C, Caspersen C, et al. D-beta-hydroxybutyrate rescues mitochondrial respiration and mitigates features of Parkinson disease. J Clin Invest. 2003;112(6):892-901. 27. Reger MA, Henderson ST, Hale C, et al. Effects of beta-hydroxybutyrate on cognition in memory-impaired adults. Neurobiol Aging. 2004;25(3):311-314. 28. Pollan M. Unhappy meals. The New York Times website. http://www.nytimes.com/2007/01/28/magazine/28nutritionism.t.html?pagewanted=all&_r=0. January 28, 2007.